Why did the snail cross the road? To go shoot the curl, of course. 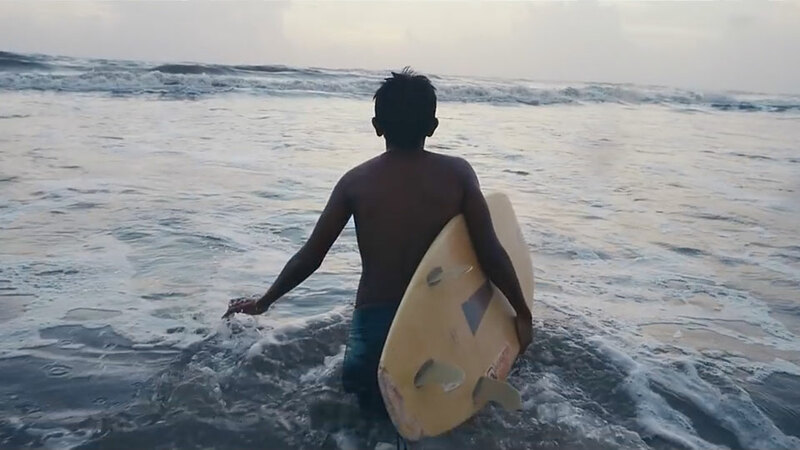 This new ad for Samsung frames the enterprising spirit (or, skeptics might say, the biological hardwiring) of a slug in a shell as as a source of great inspiration—namely, for surfers. That may sound a little stupid, but the the marketers at the consumer electronics company know it—the minute-plus commercial, by Leo Burnett Chicago, somehow manages to be existential and lighthearted at the same time, musing on the inner life of a mollusk as a metaphor for a young boy who loves the sport of surfing. It's Samsung's latest effort in a series of well-made ads celebrating the sport (not to mention the occasional gimmick of questionable relevance). The visuals are, unsurprisingly, beautiful. And the copy manages to keep its balance nicely, pulling back into humor or humility every time it teeters on the edge of an overwrought, mawkish precipice. The overall result is poetic enough that it's almost easy to forget that the company is selling anything other than good feelings—but shots of a Samsung smartphone peppered throughout remind viewers that it's handheld computers that's bringing motivation to the masses, not any kind of grandiose animal phenomenon. Because in the end, the only thing that really matters is whether you're connected to something greater than yourself—the internet—and preferably not with an iPhone. In other words, a surfer without a Galaxy is probably just a beach slug.